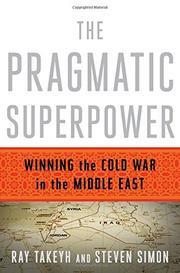 A singular take on U.S. foreign policy in the Middle East from World War II to the Gulf War demonstrates how a kind of accidental success was achieved by isolating the Soviet Union and avoiding prolonged U.S. entanglements. Takeyh (Guardians of the Revolution: Iran and the World in the Age of the Ayatollahs, 2009, etc.) and Simon (co-author: The Next Attack: The Failure of the War on Terror and a Strategy for Getting it Right, 2005, etc. ), both senior fellows in Middle Eastern Studies at the Council on Foreign Relations, look in detail at several (but not all) hotspots during the Cold War that could have potentially led to total destabilization of the region if not for American presidential leadership, diplomatic skill, or pure luck. So what did the U.S. do right, and how can it avoid the current slide back into “timeworn chaos and rivalry”? From the Harry Truman administration onward, American goals in the Middle East were to preserve the petroleum wealth for the West, avoid Soviet infiltration, and resolve the Jewish-Arab homeland dispute—not to promote democratic regimes. Indeed, the U.S. often bolstered autocrats in order to preserve stability. Yet the threat of Soviet infiltration grew dire. Truman and his advisers used the fledgling United Nations to good effect and also mobilized the international community. The authors revisit Iran during two subsequent crises—the disastrous coup to oust Muhammad Mossadegh in 1953 and the eruption of the Iranian Revolution in 1979—though the avoidance of global conflagration following both events was caused more by internal Iranian dynamics than anything the U.S. did. The authors assert that the Suez Crisis detonated largely because of Dwight Eisenhower’s wary handling of Gamal Abdel Nasser, who then proved an unlikely ally in keeping the Soviet Union from intervening in the 1958 coups in Syria and Iraq. Regarding the perennial Israeli-Arab flare-ups, the U.S. has proven to be the only superpower able to stay Israel’s hand. Contestable yet compelling arguments regarding the state of the “precarious…global scene” following World War II.